Wide diastema can be a challenge when the patient demands rapid, conservative treatment. New adhesive materials and techniques provide several options for tooth replacement. This article describes 2 cases that illustrate successful rehabilitation of edentulous spaces with artificial porcelain teeth and glass fibre. There are 2 approaches to the use of glass fibres with FRC prostheses: one involves conventional tooth preparation and laboratory-made crown restorations and is performed as an indirect technique, while the other uses glass fibre with composites in a minimally invasive adhesive bridge restoration using a direct or indirect technique.3 FRC prostheses generally involve reconstruction of the missing teeth, in which the pontics are made of composites.8,9 Shaping the pontic by covering the fibres with composites is generally preferred because of their good adhesion to the glass fibres. The most widely accepted concept for fabricating FRC is based on the use of continuous unidirectional glass fibres in the resin matrix as a substructure for the restoration. We describe 2 cases in which glass fibres were used with an artificial porcelain tooth as an alternative approach to the rehabilitation of a missing mandibular tooth and a diastema. Figure 1: Diastema between teeth 31 and 41 resulting from extraction of a supernumerary tooth in Case 1. A 21-year-old woman was referred to our clinic for rehabilitation of diastema (Fig. 1). According to the patient, a supernumerary tooth had been extracted to resolve periodontal problems, leaving a space between her mandibular central incisors. The space was present for a long time, and the occlusion had been stable for at least 2 years. Clinical and radiographic examination revealed a stable maximum intercuspation position, canine-protected occlusion, and adequate periodontal health and root support with no residual ridge deficiency. During discussions with the patient, it became clear that replacement of the missing tooth with a single implant was not possible because of the expense of this treatment. Given the patient’s youth, use of a conventional fixed partial denture was avoided to conserve tooth structure. The chosen approach involved fabricating an FRC pontic using a direct technique to provide a conservative, esthetic, rapid solution. The treatment was completed in one sitting. Figure 2: Diastema between teeth 31 and 41 in Case 2. A 22-year-old woman was referred to our clinic for rehabilitation of diastema between the right and left central mandibular incisors (Fig. 2). The diastema had been present for a considerable time and her occlusion was stable. 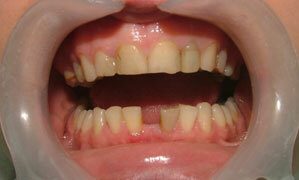 The patient refused orthodontic treatment because of the high cost and prolonged treatment period. Her main complaint was esthetic, and she wanted rapid, conservative treatment. The diastema was too wide to be improved by enlarging the incisors. Clinical and radiographic examinations revealed a stable maximum intercuspation position, canine-protected occlusion and adequate periodontal health and root support. The treatment plan was to fabricate an extra mandibular incisor from FRC to address the esthetics issue immediately. This was carried out in one session. Figure 3: Lingual view of the prepared surfaces. Cavities were prepared on the lingual surfaces of the right central and left mandibular lateral incisors using a round diamond rotary cutting instrument (Fig. 3). These cavities were at least three quarters of the mesiodistal width; both were the same size (2mm × 2 mm) and at the same level. Artificial porcelain mandibular central teeth were chosen to match the shade and form of the abutment teeth and the size of the edentulous space. The length of the fibres (Stick Tech Ltd., Turku, Finland) required for the restoration was determined using a piece of dental floss, and a bundle of unidirectional resin-impregnated glass fibres was cut. The bundle was prepared for bonding by wetting it with a bonding agent (Stick Resin, Stick Tech). The lingual surface of the middle third of the artificial porcelain tooth was etched with 5% hydrofluoric acid (IPS Ceramic Etching Gel, Ivoclar Vivadent, Mississauga, ON) for 4 minutes. It was then washed with water, air dried, and sandblasted with 30-µm silicate aluminum oxide particles (CoJet system, 3M ESPE). A silane coupling agent (Monobond-S, Ivoclar Vivadent) was applied and allowed to air dry for 60 seconds. The bonding agent was applied to the surfaces and light cured. The fibre bundle was spread gently at the middle of its length and the crampon of the artificial porcelain tooth was inserted into it (Fig. 4). Flowable composite (Stick Flow, Stick Tech) was applied between the fibre bundle and artificial tooth, bonding them under the crampon. Dual-cured resin cement (Variolink II, Ivoclar Vivadent, Schaan, Liechtenstein) was applied to the bonding surfaces of the abutment teeth before positioning the artificial tooth and fibre bundle. The bundle was pressed into the cavity with a hand instrument to ensure good contact. After placing the fibre bundle and artificial tooth, the restoration was polymerized for 40 seconds with a wide-tipped prismatic light-polymerizing unit. The fibre framework and crampon were covered completely with a layer of composite (Filtek Z-250, 3M ESPE, Seefeld, Germany) and light cured (Fig. 5). Static occlusion of the new restorations was controlled visually, and there was no contact with the upper dentition. Dynamic occlusion was checked using articulating paper to verify that there was no point of tooth–tooth contact. The pontic of the restoration was controlled so that it could be cleaned easily with SuperFloss (Oral B Laboratories, Newbridge, Ireland) and the composite was polished with polishing discs (Sof-Lex Contouring and Polishing Kit, 3M ESPE). The result was evaluated clinically at 3 months (Figs. 6 and 7) and the restorations were monitored for 5 years. During this time, there were no problems in terms of function, fractures, or esthetics, and both patients were satisfied with the treatment. Figure 4: Glass fibre bundle with the attached porcelain tooth. Figure 5: Adhesive-luted porcelain tooth. Adhesive restorations may include the preparation of adjacent teeth to provide additional mechanical retention. The described restorations with porcelain teeth required complex adhesive procedures to ensure good bonding. Glass fibres, which are strong mechanically and have a strong bonding capacity, were used to attach the pontic to the adjacent teeth. This required cavity preparation and surface conditioning (etching and bonding) of the adjacent teeth and acid etching, tribochemical silica coating, silane application and resin cements or flowable composite resins on the porcelain teeth. The crampon of the artificial tooth was inserted into the fibre bundle and the fibre was polymerized to increase mechanical retention between the FRC and the porcelain. In tribochemical silica coating, particles of aluminum oxide modified with silica are propelled with sufficient air pressure to embed them in the ceramic surfaces.15 In both of our cases, this treatment was followed by silanization.16 Roughening the ceramic surface with air particle abrasion before cementation increases bond strength, which increases significantly more when silica coating is followed by silanization.16-19 The shear strength of the bonds between the resin cement and silica-coated ceramics is significantly higher than that achieved using hydrofluoric acid and aluminum oxide to prepare the surface.7 Therefore, micromechanical retention produced by abrasion and chemical bonding with silanization of the silicated porcelain surface reinforced the mechanical retention obtained by the crampon of the artificial tooth. In one report, a fractured 4-unit posterior zirconia fixed partial denture was repaired by using glass fibre, and the treatment was successful after 12 months. 20 In that case, mechanical retention was enhanced by cavities and chemical retention was achieved with tribochemical silica coating followed by silanization. In another case, a polyethylene fibre-reinforced composite resin fixed partial denture with a ceramic pontic was used to replace a missing central incisor.4 The ceramic pontic was fabricated with IPS Empress II ceramic (Ivoclar Vivadent), and the authors reported no functional or esthetic problems over the following 27 months. In our cases, we used an artificial porcelain tooth instead of a ceramic pontic, because the former was more practical and less expensive. The need for impressions was eliminated, and treatment was completed in one session. A disadvantage of this technique may be difficulty in finding an artificial tooth of the right colour and dimensions. The evolution of adhesive materials and techniques is producing new options for replacing missing teeth. This article described the successful rehabilitation of edentulous spaces with artificial porcelain teeth and glass fibres. Longer-term clinical investigation is required to provide additional information on the survival of directly bonded anterior and posterior fixed prostheses made with FRC systems, although we have survival evidence after 5 years of follow-up. If the clinician is able to match colour and shape, restoring an edentulous area with porcelain and glass fibres may be a viable alternative adhesive restoration when the patient prefers rapid, conservative treatment. Given the limited information on the survival of these restorations, we recommend that dentists treat them as interim measures. Turker SB, Guvenli SY, Arikan A. Replacement of two mandibular central incisors using a zirconium resin-bonded fixed partial denture: a clinical report. J Prosthet Dent. 2005; 94(6):499-503. Vallittu PK, Sevelius C. Resin-bonded, glass fibre-reinforced composite fixed partial dentures: a clinical study. J Prosthet Dent. 2000;84(4):413-8. Garoushi S, Vallittu P, Lassila L. Fibre-reinforced composite for chairside replacement of anterior teeth: a case report. Libyan J Med. 2008;3(4):195-6. Turker SB, Sener ID. Replacement of a maxillary central incisor using a polyethylene fibre-reinforced composite resin fixed partial denture: a clinical report. J Prosthet Dent. 2008;100(4):254-8. Goodacre CJ, Bernal G, Rungcharassaeng K, Kan JY. Clinical complications in fixed prosthodontics.J Prosthet Dent. 2003;90(1):31-41. Rosentritt M, Behr M, Handel G. Fixed partial dentures: all-ceramics, fibre-reinforced composites and experimental systems. J Oral Rehabil. 2003;30(9):873-7. Ozcan M, Akkaya A. New approach to bonding all-ceramic adhesive fixed partial dentures: a clinical report. J Prosthet Dent. 2002;88(3):252-4. Freilich MA, Meiers JC, Duncan JP, Eckrote KA, Goldberg AJ. Clinical evaluation of fibre-reinforced fixed bridges. J Am Dent Assoc. 2002;133(11):1524-34. Freilich MA, Duncan JP, Meiers JC, Goldberg AJ. Preimpregnated, fibre-reinforced prostheses. Part I. Basic rationale and complete-coverage and intracoronal fixed partial denture designs. Quintessence Int. 1998;29(11):689-96. Vallittu PK. Survival rates of resin-bonded, glass fibre-reinforced composite fixed partial dentures with a mean follow-up of 42-months: a pilot study. J Prosthet Dent. 2004;91(3):241-6. Monaco C, Ferrari M, Miceli GP, Scotti R. Clinical evaluation of fibre-reinforced composite inlay FPDs. Int J Prosthodont. 2003;16(3):319-25. Şanal F, Güler AU, İnan U, Özdemir OS. Alternative treatment procedure in the case of fractured abutment of adhesive bridge: a clinical report. J Esthet Restor Dent. 2011;23(2):89-96. O’Brien WJ. Dental materials and their selection. 3rd ed. Chicago: Quintessence; 2002. p. 132-55. Bottino MA, Valandro LF, Scotti R, Buso L. Effect of surface treatments on the resin bond to zirconium-based ceramic. Int J Prosthodont 2005; 18(1):60-5. Valandro LF, Ozcan M, Bottino MC, Bottino MA, Scotti R, Bona AD. Bond strength of a resin cement to high-alumina and zirconia-reinforced ceramics: the effect of surface conditioning. J Adhes Dent. 2006;8(3):175-81. Ozcan M, Vallittu PK. Effect of surface conditioning methods on the bond strength of luting cement to ceramics. Dent Mater. 2003;19(8):725-31. Madani M, Chu FC, McDonald AV, Smales RJ. Effects of surface treatments on shear bond strengths between a resin cement and an alumina core. J Prosthet Dent. 2000;83(6):644-7. Blixt M, Adamczak E, Lindén LA, Odén A, Arvidson K. Bonding to densely sintered alumina surfaces: effect of sandblasting and silica coating on shear bond strength of luting cements. Int J Prosthodont. 2000;13(3):221-6. Bagis B, Ustaomer S, Lassila LV, Vallittu PK. Provisional repair of a zirconia fixed partial denture with fibre-reinforced restorative composite: a clinical report. J Can Dent Assoc. 2009;75(2):133-37.